Ni Zan (1301-1374). 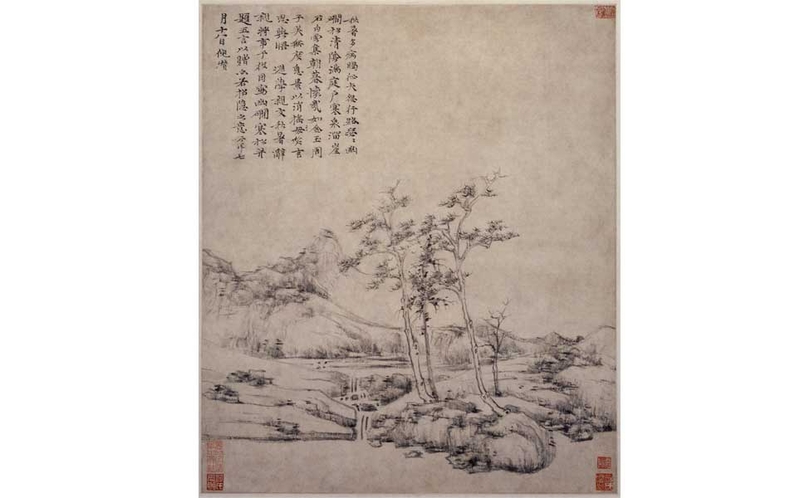 "Secluded Stream and Cold Pine," China, Yuan dynasty (1279-1368), 14th century. Hanging scroll; ink on paper. Palace Museum, Beijing (Gu 00006157). Wu Zhen (1280-1354). 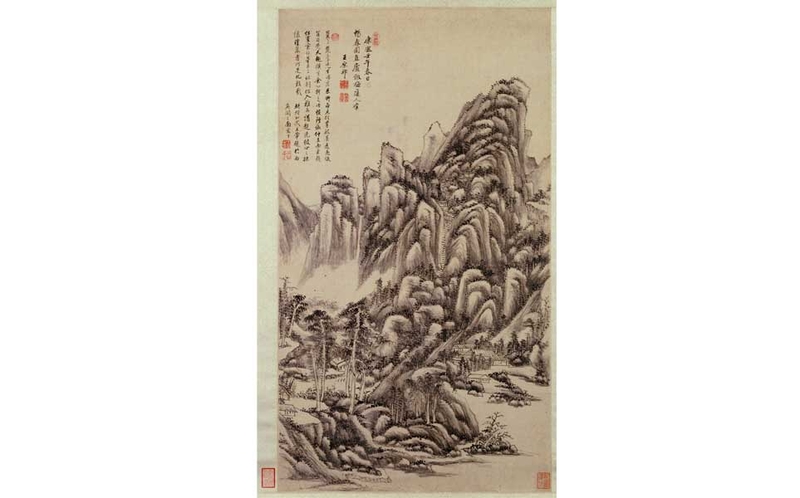 "Lofty Reclusion Within Mountain and Stream," China, Yuan dynasty (1279-1368), 14th century. Hanging scroll; ink on silk. Palace Museum, Beijing (Gu 00005218). Wang Shimin (1592-1680). 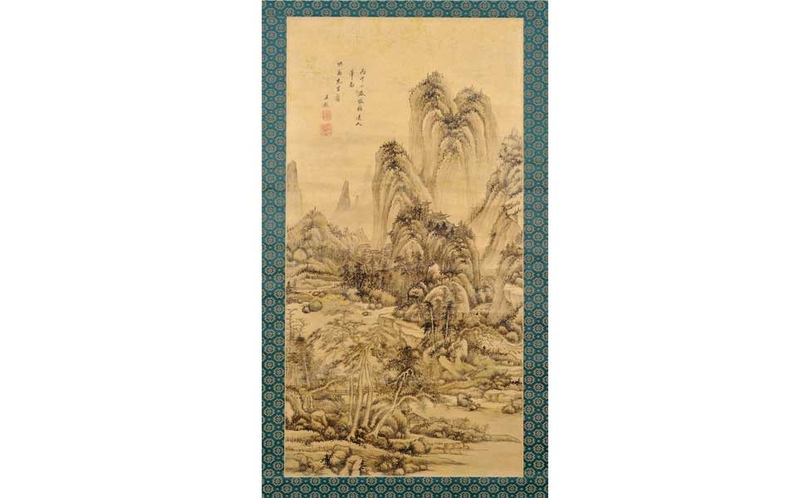 "Landscapes Inspired by Du Fu's Poetry," China, Qing dynasty (1644-1911), dated 1665. One leaf from album of 12 leaves; ink and color on paper. Palace Museum, Beijing (Gu 4873). Zhao Mengfu (1254-1322). 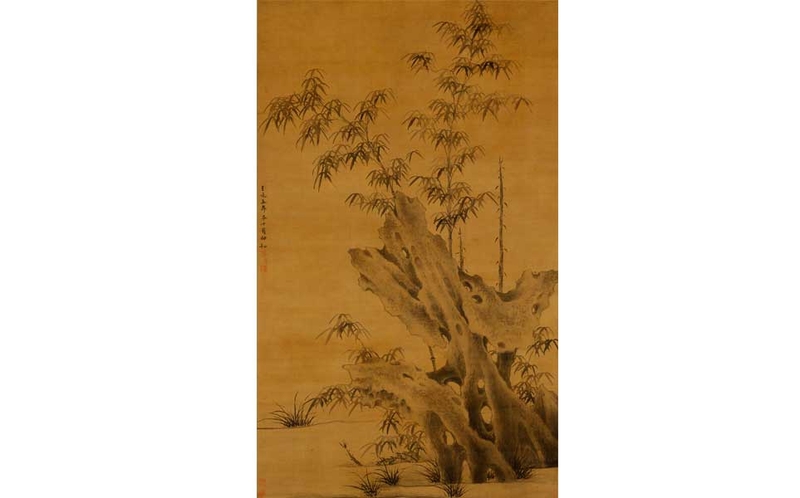 "Rock and Bamboo," China, Yuan dynasty (1279-1368). Hanging scroll; ink on silk. Palace Museum, Beijing (Xin 00016635). Wu Zhen (1280-1354). 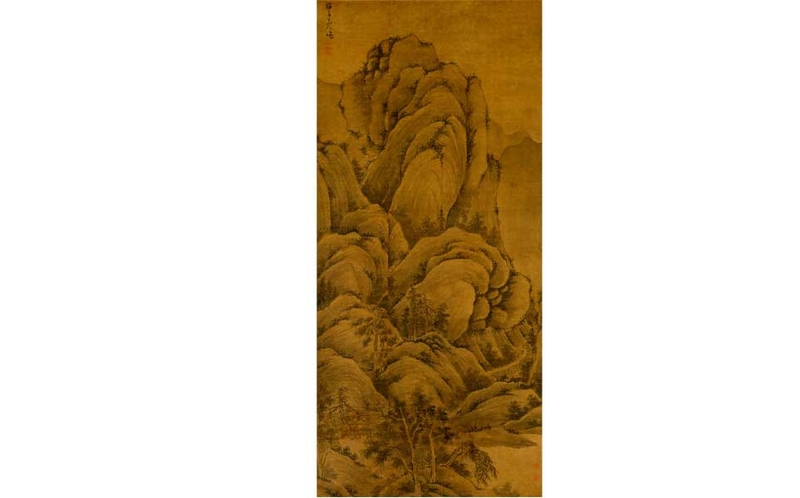 "Bamboo and Rock on Slope," China, Yuan dynasty (1279-1368), 14th century. Hanging scroll; ink on silk. Palace Museum, Beijing (Xin 00146432). Wang Yuangi (1642-1715). "Landscape After Wu Zhen," China, Qing dynasty (1644-1911). Hanging scroll; ink on paper. Palace Museum, Beijing (Gu 00008155). Wang Jian (1598-1677). "Landscape after Wu Zhen," China, Qing dynasty (1644-1911), dated 1666. Hanging scroll; ink on paper. Purchase and Partial Gift of Mr. and Mrs. Mitchell Hutchinson, 1991 (6058.1). Wen Boren (1502-1575). "The Red Cliff," China, Ming dynasty (1368-1644), 16th century. Fan; ink and color on gold paper. Purchase, 1967. Honolulu Academy of Arts (3507.1). To help you delve more deeply into the exhibition here are podcasts that focus on ten works on view. 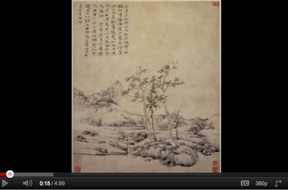 Take a tour of art focusing on Chinese Landscape Masterpieces. Please check-in at the Visitor Information Center to attend this tour. The museum's Doris Duke Theatre presents this series of some of the most influential films by Chinese filmmakers and about Chinese culture. After more than a year of planning and organizing with the Palace Museum in Beijing, the Honolulu Academy of Arts presents the collaborative exhibition Masterpieces of Landscape Painting from the Forbidden City. The landmark exhibition is inspired by the goal of the Asia-Pacific Economic Cooperation Leaders Summit (APEC), being held concurrently in Honolulu Nov. 8-13, to encourage cooperation among the nations of the Pacific region. This art-world example of Asian-Pacific cooperation is co-curated by Dr. Shawn Eichman, Curator of Asian Art at the Academy, and Drs. Li Shi and Fu Dongguang from the Paintings and Calligraphy Department of the Palace Museum, part of what is popularly known as the Forbidden City. 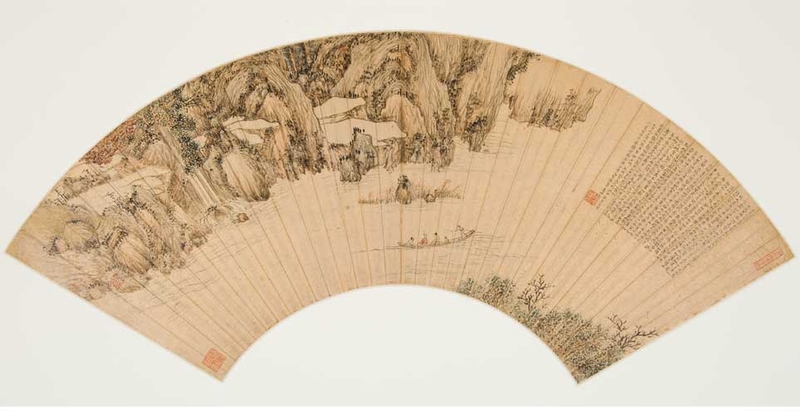 The exhibition includes 56 paintings from the Palace Museum, which has the largest collection of Chinese paintings in the world, and 19 paintings from the renowned collection of the Honolulu Academy of Arts. 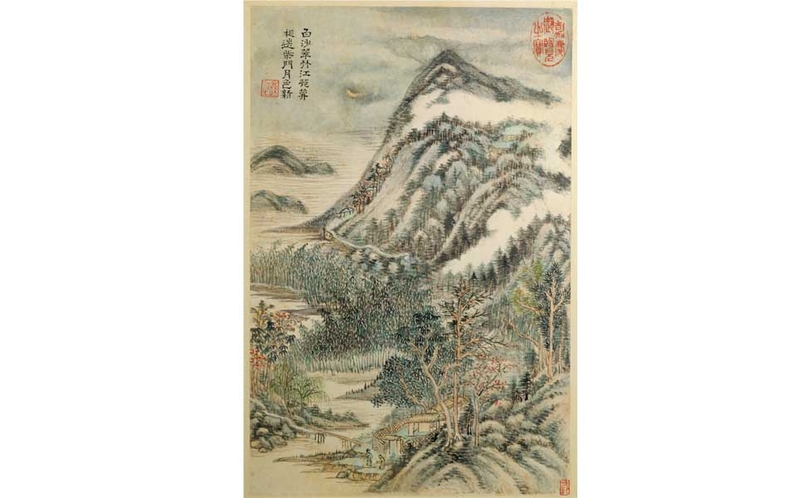 Together, these works reveal a painting revolution that happened in China during the 13th and 14th centuries, and forever changed the course of the arts, with its influence still felt today. At the heart of the exhibition is a group of rare, early works by the four most influential artists of the Yuan dynasty (1279-1368), known as “the four Masters of Yuan Dynasty Painting”— Huang Gongwang, Wu Zhen, Ni Zan, and Wang Meng. These works have never before been allowed to travel outside China, and are not regularly displayed in the Palace Museum. Similarly, this will be the first time that any of the exhibition’s later Ming (1368-1644) and Qing (1644-1911) dynasty paintings from the Palace Museum will be included in an international exhibition. 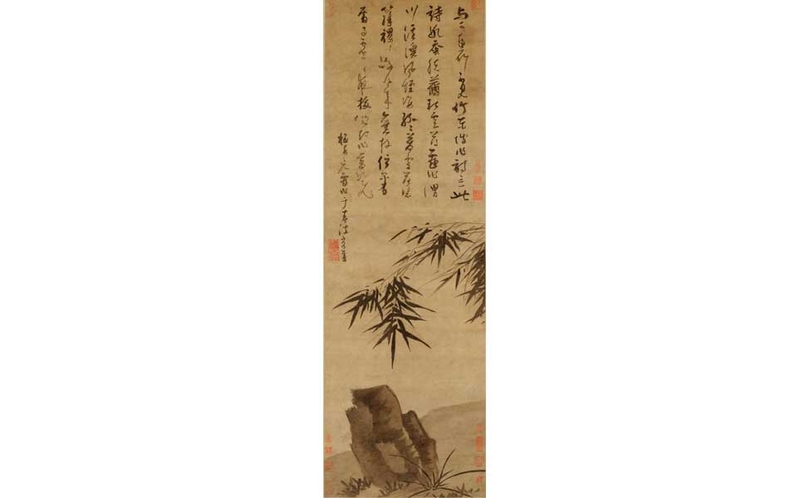 The 19 paintings from the Academy's collection will be paired with related works by the same artists from the Palace museum, offering a once-in-a-lifetime chance to view these scrolls together, which in many cases have been separated for centuries. The Four Masters are among the most revered artists in Chinese history. They are paragons of the scholar-amateur or “literati” style that characterizes the highest ideals of Chinese painting, and represents a quintessential aspect of Chinese culture. Masterpieces of Landscape Painting From the Forbidden City showcases paintings by these iconic artists and explores their influence on later generations. The Yuan dynasty marks the first time time China was invaded and ruled by a foreign power—the Mongols. (The Manchus later also took over the country.) The political and social changes of this tumultuous time led to the Four Masters’ groundbreaking artistic vision. They developed a new way of seeing the natural world, and their artistic expression is in many ways reminiscent of Impressionism, although it precedes the Impressionists by five centuries. Free of the restrictions of court patronage, Chinese artists at the time were no longer dominated by academic tradition and could put more of themselves into their work. The Academy has produced a handsome 112-page catalogue to accompany the exhibition. Available at The Academy Shop. $19.95. Major support for the exhibition was provided by the E. Rhodes and Leona B. Carpenter Foundation, Japan Airlines, Hotels & Resorts of Halekulani, the Freeman Foundation and DFS Hawaii. Additional support was provided by the Atherton Family Foundation, the Hung Wo and Elizabeth Lau Ching Foundation, Timothy Choy, Tai Yau and Norah Chung, Sam and Mary Cooke, Gene and Cecilia Doo, Eddie and Peggy Eu, Sandy and Jill Friedman, Julia Ing, David and Cecilia Lee, Ernest and Letah Lee, Worldster and Patricia Lee, Ricardo and Rosita Leong, Violet Loo, Warren and Carolyn Luke, Joanna Sullivan, the Jhamandas Watumull Fund, Joe and Leonora Wee, Bob and Betty Wo, Bill and Margaret Won and Reuben and Vera Wong. The exhibition is also supported by a grant from the Hawai‘i Council for the Humanities and by an indemnity from the Federal Council on the Arts and the Humanities. To help you delve more deeply into Masterpieces of Landscape Painting from the Forbidden City, a collaborative exhibition between the Honolulu Academy of Arts and Beijing's Palace Museum, here are podcasts that focus on ten works on view.